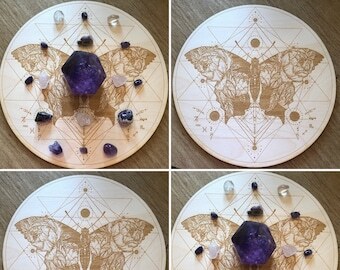 This is a Mandala crystal grid made out of Birch wood. 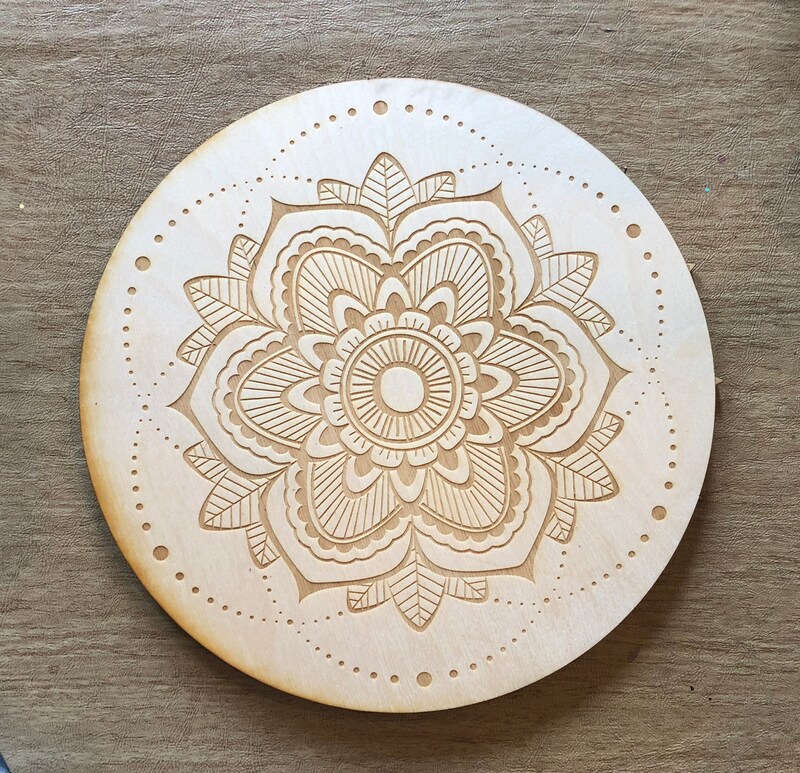 These are made to order, you can choose between approximately 3, 6, 9 and 12 inches in diameter and 1/4" thick. This is just for the grid, stones much be purchased separately. I can ship 3-4 grids for the same price so if you order more than one, the overages will be refunded. Lovely piece, and fast shipping. Thank you! We may reserve an item for you for up to 7 days. If you need more time than a down payment will be required. If the buyer does not pay for the item in full within the time frame agreed upon or decides that he or she does not want the item, then the down payment(s) will not be refunded and the item will be relisted. We will accept canceling an order, for normal transactions, as long as it has not been shipped. We will offer a full refund. If you order something custom (astrology charts, jewelry, crystal grids) and I start working on it I will not refund a cancellation. If you are not satisfied with your order, please let us know. We will do what we can to satisfy your needs. We do not offer refunds if you simply changed your mind or on custom items, but are open to exchanges or store credits but you will be responsible for all shipping charges. It's always great if you check with us first vs. just leaving a bad review. We will ALWAYS work with you. Keep in mind all wood products have natural wood markings and knots and we will not accept a return simply for that reason. In the event an order is damaged in the mail, we are not responsible although we will take each issue on a case by case basis and may offer a refund. All pieces are wrapped very well for travel : ) We encourage the buyer to purchase mailing insurance for the unlikely event of items damaged during the mailing process. All domestic orders are shipped with delivery confirmation or a "tracking number." This discourages lost packages. If a package does become lost or stolen, we are not responsible. Standard First Class International shipping cannot be totally tracked, although a customs number is assigned, it is not a guarantee that the package could be found. International packages can be sent in a variety of ways and tracked with an extra charge. We offer domestic and international shipping through USPS. Most items are shipped First Class (2-4 days) shipping with Delivery Confirmation (tracking number), priority and priority express are available. All items are packaged well with bubble wrap in a secure box or padded envelope. We are not responsible for items lost or damaged during shipping. International shipping carriers and options may vary. We are not responsible for any VAT Tax or customs fees that may be charged for international shipments. I do offer wholesale on my crystal grids, oils and some jewelry. Contact me directly for more information. I do offer custom orders. I can make custom oil blends, custom rock selections as well as custom wood engraving and crystal grids.